Disclosure: CS Gems gifted me some jewelry and The Fashion Lane provided me a discount to shop in exchange for these photos and this blog post. All opinions expressed are my own. Yay for short weeks! I'm only working Monday through Wednesday this week and then we're off for a long weekend in SoCal because the nephew turns ONE this weekend! Not sure how time has flown by so quickly! But before those festivities kick off, I do have a few things to share with you this week! Let's start with this adorable printed dress from The Fashion Lane! You can see the other two outfits I styled with CS Gems and The Fashion Lane here and here. I was basically in love the second I laid my eyes on this dress. The print and embroidered trim are beautiful I will be packing this with me this weekend on my trip for sure! 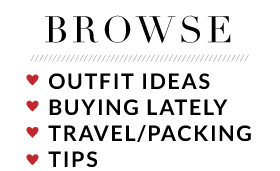 Very packable and versatile to dress up or down, which is ideal for me not knowing what our exact plans will be. These style events have been pretty great. I basically bring a few basics - some jeans, shoes, and clutches, build outfits using pieces from the boutique and finish off the look with accessories from CS Gems. Not knowing what you'll end up wearing makes it pretty fun for all parties. And it also proves how versatile the jewelry from CS Gems really is - there's always a piece or two or three that will go with what I'm wearing. Oh! Before I go! If you're local to the St. Louis metro area, you'll be happy to know that The Fashion Lane has opened a brick and mortar store in Clayton! They're at 7529 Forsyth, so be sure to stop in and say hello! I hope you enjoyed this series! I'm sure there will be more of these in the future! 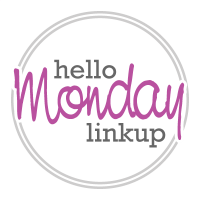 Linking up for: Monday Mingle, Shoe and Tell, Rachelle and Cha Cha for #HowISummer. that dress is so pretty I adore the print. I see why you liked it. Have fun in Cali. Love this dress on you! These were our favorite pics! Have fun in California! Love the print of your dress. Very playful yet classy at the same time. Happy Monday, Carylee! That's my kind of dress and the necklace makes it all pop!!! Love how simple this dress is. Such a great canvas for styling and of course you hit it out of the park with all the gold. 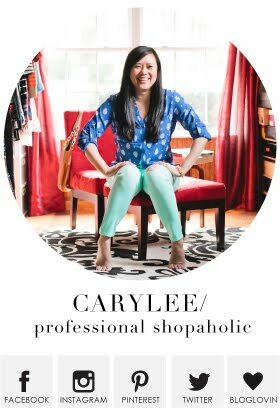 Love this dress, Carylee! 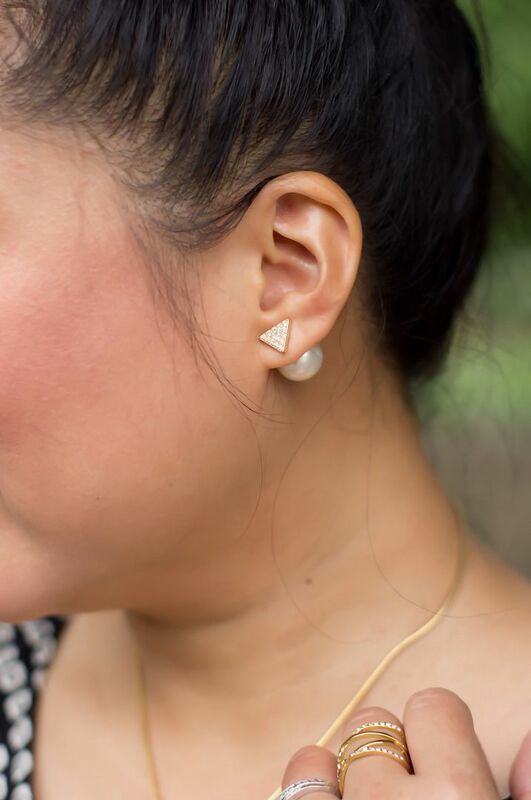 The classic silhouette will always be one of my favorites and looks amazing on you! Love the pattern and fit of this dress! Your jewelry is so pretty. Hooray for short weeks! Enjoy the birthday party with your nephew and family! Yay indeed for short weekends! We narrowly missed a hurricane down here in S. Fl and next week is a short work week. Loving your ensemble today, it's quite elegant! The earrings are stunners! Love the easy feel of this dress and I love the fact that you added gold accents to dress it up. Have a fun long weekend! Loving all of your accessories! Those earrings are so adorable! Your jewelry and clutch look amazing with this dress! Very chic, and relaxed at the same time. And I love the ear rings! That print is so fun! I love all of your jewelry too! Fun dress and all of the jewelry is perfect. Have fun on your trip. The one year birthday is always fun. loving all these beautiful jewelry pieces! Happy birthday to your nephew :) I'm sorry we couldn't make a get together work, but I hope you have a great time here! Love the dress. I would wear it all the time I'm sure. I love all of the details you added too! 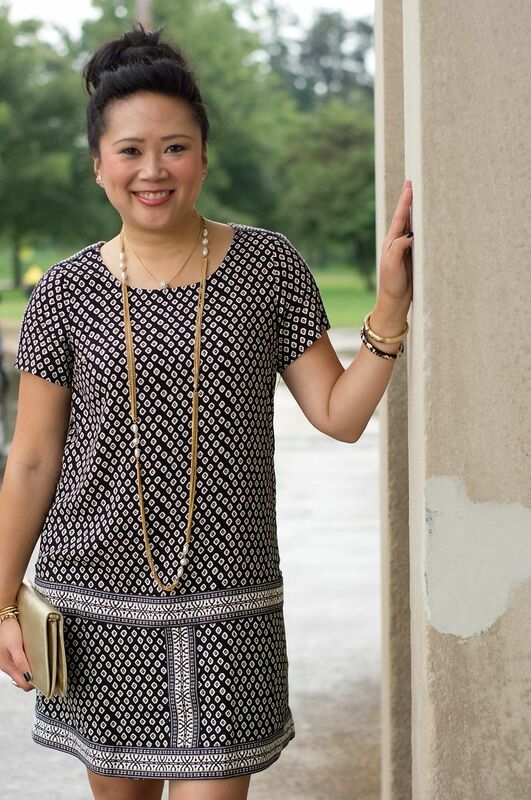 You look beautiful in this print dress and your dainty accessories matched perfectly! Love your earrings. I am just starting to notice that you have a lot of great rings! We will need details on those, too, por favor. :) Such a cute dress and look altogether, and if something changes in your SoCal plans to make you more available, text me ASAP!